What was Project GAIN and who was involved? Project GAIN was a unique landmark study that I cobbled together using several grants in 1993-1994. 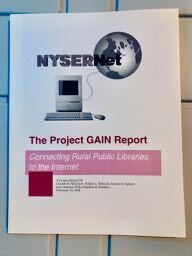 It extended Internet connectivity to five rural New York State public libraries, and one Indian Nation school. Prior to the early 1990's, it was commonly recognized that the Internet was difficult to use. First, there was the problem of connecting to it. How do you find it? Where is the "Information superhighway," anyway? One could not just open a telephone book and look under "INTERNET" to find an Internet service provider!